Andrea and I had the opportunity to join other coalitions from across the country in Washington, D.C. this past week. 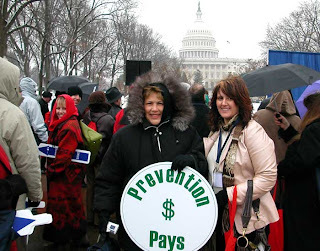 The rally on Capitol Hill we attended (on a freezing cold snowy day) was to ask congress to keep prevention on the agenda as a top priority so that we can continue to work in the fields of drug and violence prevention in our community. We had the chance to talk with Major General Arthur Dean, Chairman and CEO of CADCA (Community Anti-Drug Coalitions of America) and many wonderful people that have common missions. It was a very positive and worthwhile experience...even though our toes almost snapped off that day! We have a great thing going in this community called the Safe Communities Coalition. It is comprised of many wonderful people in the Santa Fe and Hitchcock areas. We are making a difference. Please join our coalition and help us to continue! To see the article of our National Leadership Forum in D.C., please visit CADCA.org.